This JWraps designed wrap has been designed, printed and cut to exclusively fit your DJI Phantom 3 Drone Professional Quadcopter Drone (Drone NOT included!). The patent pending wrap from industry leader JWraps is made of high performance 3M Vinyl (the same as used in vehicle wraps) has the durability you want to protect your drone from scratches, spills, hits and accidental drops. Plus, this best selling heavy duty wrap looks great and is a fun conversation starter! Each wrap comes with easy to follow instructions on how to properly apply your new wrap. With the instructions we also provide you online links to videos so you can watch a skin being applied to your drone. JWraps covers are designed to be easily removed from the drone and remote and leaves no sticky residue behind on your device. PLEASE NOTE: Some templates may alter design based upon drone features. JWraps moves the template for each design based upon overall feedback from previous customers and our own research. We hope you enjoy your custom wrap! JWraps, a family run business based in the Sandhills area of North Carolina, has seen rapid growth and success in the vinyl wrap accessory market just in the past three years. They have become well known throughout the U.S. market because of their attention to detail, investment in state of the art equipment, use of only top quality materials and providing legendary customer service to their customers in the United States and around the world. Oh Snap Products, based only a few minutes from the JWraps factory, is proud to partner with them by being their exclusive Amazon Store seller for wraps, stands and other vaping accessories. Thank you for your purchase! 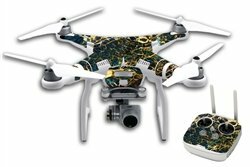 Patent pending "Galaxy Stone" custom wrap from JWraps is a protective skin exclusively designed for the DJI Phantom 3 Professional Quadcopter Drone. 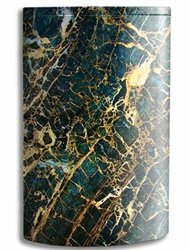 This contemporary stone design wrap add styles and a unique look to your drone! Drone NOT included - we are selling ONLY the designer wrap. This custom skin is designed, printed and cut to fit your drone perfectly (Drone NOT included!). Drone wraps cover the top of the drone body and remote control with all necessary cut outs already done for you! Includes easy DIY instructions. Make your drone stand out from others! JWraps uses only the best in high quality industry tested 3M vinyl so you can be confident of its durability. Make your drone stand out from others! These wraps are made from sturdy vehicle wrap vinyl, NOT a cheap plastic decale! Any JWraps drone wrap can be easily removed and does not leave any sticky residue behind on your drone or remote body. Free Shipping! 100% Made in the U.S.A! Oh Snap Products is the exclusive Amazon Dealer for all JWrap Products!